Here are six science activities that are perfect for introducing your pre-K or Kindergartener to experiments and the scientific method. 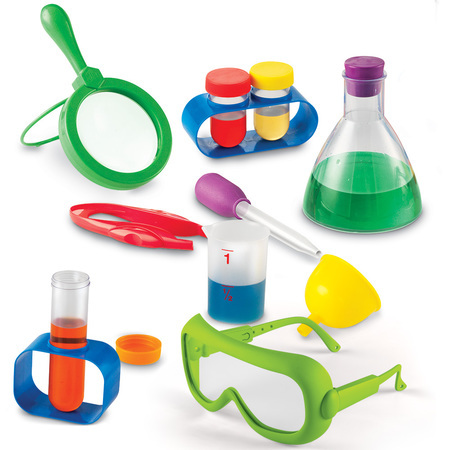 These are classic science experiments tailored for a younger audience. Have fun! INVOLVE YOUR KINDERGARTNER: Let them hold the celery as you explain that plants drink water, and collect the water at the roots. Let them trace their fingers along the stem to show you which way the water moves. Let them select their own color, and mix a few drops of food coloring into water. You can even let them practice pouring their own jars. Let the stalks sit for a few days and let them make and discuss their observations! INVOLVE YOUR KINDERGARTNER: Give them about 5-10 objects to touch and explore. Explain to them you will be dropping them in water to test if they sink or float. Let them each make a prediction, and explain to them that a hypothesis is making an educated guess. Be sure ask them a lot of questions about why they are making their guesses. Then take turns dropping each item into the water! Be sure to record your results for discussion. INVOLVE YOUR KINDERGARTNER: Let them pick through and find the dirties pennies. Give them a salt shaker and let them shake the salt on the pennies, and use the eye droppers to drop vinegar. Explain on a basic level that a chemical reaction can change something. In this case it is cleaning the pennies. INVOLVE YOUR KINDERGARTNER: Let them break the noodles into small peices. Allow them to pour the water and vinegar, then add the noodles. Be sure to talk about chemical reactions as they add the baking soda to the mixture. It will fizzle, let them know it created bubbles that will help the spaghetti dance. Let them observe with magnifying glasses. INVOLVE YOUR KINDERGARTNER: Let them mix the water with food coloring, and pour away. Be sure to let them make predictions about which colors will be made when they mix. We start with the basics (red, yellow, blue) but then let them make up whatever mixes they want! Be sure to have FUN! !